It's here! It's here! It's the first day of Bloggy Friendship Days! Welcome one and all! We're glad you could make it! Just a reminder, you need to head over to Homesteader's Heart to get more of the scoop on friendship, OK? Of course, we love and treasure our friends that we already have in "real life." But we're talking about the unexpected pleasure of making new true friends through blogging. When I started blogging, I was hoping for a sense of connection and a little community, but I had no idea that I would make some really good friends along the way. They know a lot about me and they will laugh with me, cry with me, and pray with me whenever I need them. Some of us have had the bonus of meeting (in real life) our bloggy friends and some of us may not meet some of our best friends for years! Now I consider all of my blog readers friends, so please don't feel bad if you're not mentioned! I'm talking about the friends that I know really really well. My first blogging friend is Sarah from Real Life. She didn't know that I would force her to be my friend! :) Her blog inspired me to start blogging and she helped me out in so many ways on my blog. Over the past year, I have grown to know Sarah even better and we have so many similarities. If we got together, we would talk and laugh nonstop. And we get to a bit through vlogging and through Sarah's new show on MomTV! Another good blogging friend is Sarah Mae from Like a Warm Cup of Coffee. I found her blog shortly after she started and have been around over there ever since, watching her develop and grow her blog. Sarah Mae is a sweetheart and she inspires me with her thoughtful, sometimes convicting blog series. We share some of the same struggles in motherhood, so I can really relate to a lot of things she talks about. Sarah Mae -I hope I see you at a blogging conference someday! I keep making new friends as I go along like Alicia from Confessions of a Snowflake (we could chat over coffee and talk about motherhood and having "only" sons). I've also made friends through twitter and blogging like Donna from Way More Homemade (she is a true foodie and I like to eat food!) and Nicole from Being Frugal Is Fabulous (we actually got to meet in real life, most recently at Yanni Voices). So many wonderful bloggy friends, including Kim - but I'll talk about her some more later! 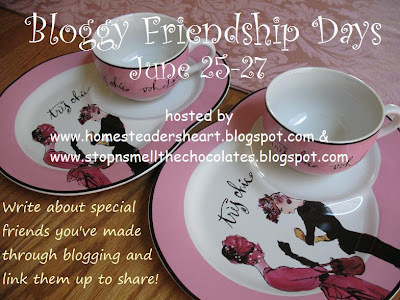 In fact, you do need to stop over at Kim's place to read more about Bloggy Friendship Days! Tomorrow is Chocolate Friday here, but as part of Bloggy Friendship Days - I'll be showing you the battle of the chocolate between Kim and me! You can link up your chocolate posts as usual. And at Homesteader's Heart tomorrow is her usual Friday Funnies - you've got to go over for some laughs. Kim will be sharing some special Bloggy Friendship funnies - who knows what she might say?? And you can link up your own Friday Funny posts at her place. Then, your mission - should you choose to accept it - is to write a post about your special bloggy friendships or thoughts on friendship. Post it on your blog today, tomorrow, or Saturday. On Saturday, come link it up here AND over at Homesteader's Heart - double the fun!! You are so good at wording things. I was all over the place in my post! LOL. But that's the way I roll! Hee! Hee! Big it could only be better if we lived next door to each other size hugs! This is such a sweet idea for a meme! What a a great thing, celebrating blogging friends. I'm really thankful for the wonderful women I've met through blogging! You included! Oh yes - Sarah Mae at Like A Warm Cup of Coffee is my favorite blogger. The others are new to me so I'm happy to check them out! BTW - I've tagged you for the Ultimate Recipe Swap meme! You can find out how to participate by visiting me at Family Foodies! Would love to see you participate! What a great tag team idea. Love this...would you ever had thought that you could feel like you're friends with people you've never met? Such an unbelievably fun thing. I hate that you caught me on vacation with this. I have a friendship post in mind and will post it soon with link-backs. You have been such a sweet friend to get to know, Lisa! I'm hoping we can meet IRL soon!